Last edited by DingusMcGee on Feb 07 2018 8:52pm, edited 2 times in total. I have looked at the pictures of the bent motor frame mounts posted above. It looks like a gear clamp around where I suggest would give some structural triangulation for the frame size 68 -83mm BB width. -- think rigidity to lateral movement. Let me know how this fix goes. will the chain slip at the first ride? Someone has successfull convince Cyclone to replace the engine in warranty? No. And I wouldn’t want to. That looks like it was dropped on a concrete floor and it hit right on the edge of the freewheel. Where did you purchase this from? Did the box it arrived in look damaged? That really doesn’t look fixable or usable to me. Time for you to return it to where you purchased it for a replacement, or file a claim with the shipping company. I bought it from Turbobikekit, the “europe reseller” to avoid customs problems.They also claims that their products have European Warranty ...but as matter of facts it isnt a real reseller (like Lunacycle), they only tooks orders and forward to Cyclone in Taiwan. I tried to contact Turbobike unsuccessfully, no replies at all. I can’t suggest this seller to anyone. Thereby I contacted direcly Cyclone tw, they have a very fast reply, they proposed to sent to me for free the gerarbox and the freewheel as a replacement part, but I must sustain other 50$ of shipping costs (and probably related customs taxes). Without a real local reseller I think is the best I can be obtained. The early c-3000 motor frame can be readily modified to adjust for chain slack or tenson. These adjustments work when gear clamps are used to stabilize the motor frame. In the above photo the 15/48 cog chain setup was a little tight even though the pin was pressed with the chain on the cogs. To get a little chain slack put smaller cylindrical spacers on the upper thru bolt on both ends. Chisel off the cooling fin on the left side that's prevents the spacers from resting on the motor case. A tiny gear clamp is added to over spacer ,to take up the last bit of slack. Thickness is about0.030" or 3/4 mm. To tighten a loose chain you will have make a hinge plate bigger than the OEM hinge which has the centers separed by 21mm. The material is about 0.44 in. Thick. This bigger hinge plate is to be swapped into place on the bottom hinge. This bigger plate will lengthen the distance from the bb axel to the motor axel. The distance to increase the hinge hole spacing is about 1/2 the length the chain is too long. When making this change you will likely need to swap out the barrel spacers on the thru bolt ends. I repaired two more 3000W motors today that had bad Hall sensors, one with a rotten rear bearing as well. Got them running as good as new. I opened one more short stack motor that was burned so badly it was like a stinky dusty ashtray in there-- so no saving that one. Even the bearings were burned. Recent Cyclone 3kW motors use a unit PCB with all three Halls mounted on it, but all three of the ones I serviced today were the earlier type with separately installed sensors. I had to cut the sensors off of replacement boards and solder them into the old wiring. Another difference between recent motors and older ones is the phase wiring color assignments. All three of the phase wires must be color mismatched on a new controller to make it work correctly. These motors may not be as completely reliable as I'd prefer, but they are pretty straightforward to service, and I appreciate that. Alright I'm here to voice my opinions before joining the cyclone cult with my FUTR beta. I will first fix my bmc v4 and it's little hall sensor issue and sell it off for a tiny fraction of what I paid for it and trade that cash in for a cyclone mid drive. I've got quite a few questions though. They are mostly opinion questions so no need for real research. I will be mounting the motor directly to the frame through a bracket similar to a design LR did on his new mid drives. This should be enough to fight off any of the motor flex when accompanied with the bottom bracket mounts but my question is with the square taper bottom bracket. I've read reports that say it's useless to use and often is a source of flex and therefore chain throwing, does anyone have any anecdotal experience with this? Running the motor at 63V and 60A what sort of gear ratio do you recommend with the stock double chain ring. If anyone could let me know of their speeds and gear ratio etc. Single speed or steel cassette? or a modified cassette to adjust the chainline etc? Anyways, I'm hoping this idea goes well, I'll be asking you guys a lot if I go this way! Even without the cyclone added a square taper requires a torque wrench to install properly. Coming loose is almost guaranteed if you don’t use one, assumes you know the torque setting to use. This is what’s required for normal bike use, so a must with a cyclone. I think using the isis bottom bracket makes the torque setting less important, just crank it up tight. I’ve used single speed 16t, 22t and 36t. I went to an xt cassette because adding the cyclone makes a bike a multipurpose bike. You want to go fast to get to the trials and the gears to be able to ride hills once you get there. Chains and cassettes are cheap for 9 speed so no big deal to replace yearly if needed. 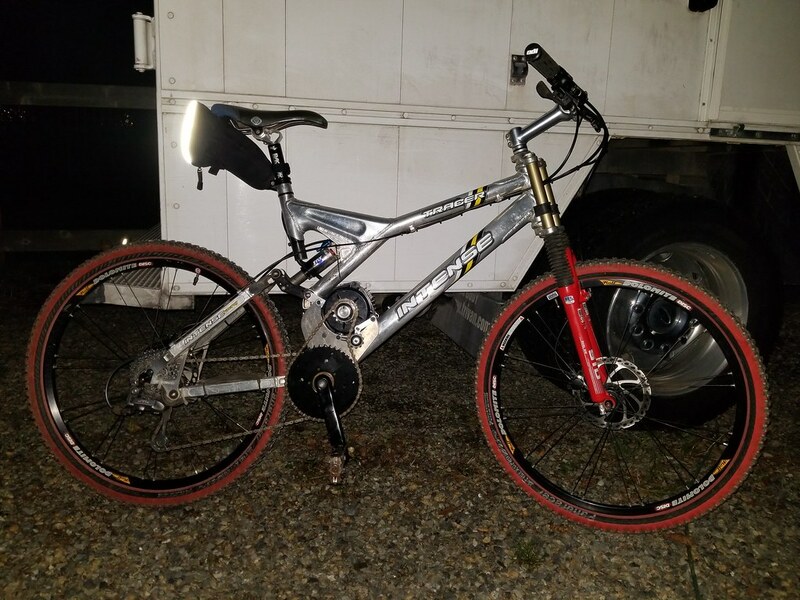 I’m running xtr mtn bike derailleurs from the 90’s and they work great, about $25 eBay etc. I want to see someone put the mid drive in the battery holding area down low and not use the bottom bracket, brackets at all. I know motor cooling and loosing battery space are factors. Putting the motor inside the battery space would require frame modification. I think the cyclone is too big to do that comfortably. There is an ebike for sale local to me that has done just that though and the frame looks really good! Mounting the motor underneath is a different story and the simplest option if accompanied by the bottom bracket mounts. I don't know how bad the Cyclone kit's chainline is, but it might be beneficial to choose say your favorite two-thirds of your available gears and place them all on the end of the cassette that had the best chainline (almost certainly the outer part). Stick the others on the inside and use the derailleur's limit screws to lock them out of the game. Did that with a BBS02; 11-17-28 with 8-speed spacing, and an inexpensive Altus derailleur worked fine. some one have any problem with the freewheel of the motor? because it are my second freewheel(13T),the first(stock 14t),all after non more 4 month it broke. The 14t stock freewheel is not durable. Where I work, we substitute the 13t heavy duty unit. Note that any one of these freewheels will fail quickly if there is tension on the chain when the motor isn't running. the heavy duty version of the motor cog that Sickbike Parts sells is a 14T, not a 13T. Do you have another supplier for a heavy duty 13T than Cyclone sourced? When we aren't using the 13t heavy duty freewheel pre-mounted on a collar by Cyclone, we use 13t Odyssey freewheels. the 13t Odyssey freewheels do you report if it stronger than pre-mounted and 13t selled from cyclone-tw? I got ACS Crossfire Freewheel from ebay. So far it has not blown up. They both seem OK and they both hold up well if the chain isn't overtightened, but the Odyssey seems stronger and better made. We special order motor + controller sets from Cyclone and they furnish HD 13t freewheels for us on request. So much fun! Did my first longer ride today. Hello again everyone! It's been a while since I've posted. My Cyclone 3kw ebike project is still a project at the moment. I'm going to be ready to order a BMS and assemble my battery in the next few weeks. Balancing my funds has been tricky but at least this way I'll get to enjoy and test it all spring and summer. I'm currently communicating with BesTech for a BMS. They recommended one that isn't listed on their site for my needs and sent a document for review. Protecting my cells and their capacity is my number one priority right now, and this looks pretty good. The doc looks a little different than the others on their site and I got a confusing answer when I asked how this model was "adjustable" since the whole column seems to be adjustable. When I asked the rep replied with "Adjustable means we have several matching parameters for you to make choice. All parameters are ready programming in factory and ready to use, also our MOQ is 2." so I dont quite understand if I can, or cannot order one with some custom values if I wanted or needed to. I want to limit my cells to 4.05v-3.0v to keep them healthy for a long time, but I also would like the ability to charge them to 4.2v when I want to go a little further, and down to 2.7v as a "limp home" mode and I would limit my current as well. Are there any controllers that would let me do this? I was looking at the Kelly KBS72121, but I have heard they aren't great controllers. One is on Alibaba and I haven't gotten a quote for shipping yet. I asked for a square meter with, and another without adhesive to make sure I have plenty of extra just in case or for future projects. And the price was $170 for those two meters. The other company I contacted, Stockwell, has the same variety of poron. However they have a $150 minimum for your order. With the pricing they gave me, and if my math is correct, I can get two sheets of 5.5'*4.25' (or about 1.68m*1.30m) of poron with and without adhesive for $150. I'm probably going to order through them. Last update note, I had a fairly complexish design for my battery housing. I was hoping to have Tapplastics cut and assemble it for me, but they said it would cost $700. Now I'm planning to either buy the sheet of ABS and heat it to bend it around a sheetmetal template. Or I might 3D print the housing when I get my Prusa MK3 delivered and assembled. I have effectively clamped and bolted a 48T steel chainring between 2 34T Shimano chain rings and placed the big ring on the freehub. A 13T cog will almost fit tight in the 48T chainring center hole. I used 0.005" shimstock at the 13 contact points to accurately center the chainring with respect to the freehub. The homemade 48T cassette cog in use. Projection Racing of UK sells a spider arm adapter that will do the same job easier. It is available in aluminum or Stainless steel, costs about $20 and ships for $14 via Royal Mail. Contemplating joining the "Cyclone Asylum" (humor intended)...currently a two time member of the MAC club. A. What is the difference in the mounts listed below? B. I have a Mongoose Hitch fat tire bike and the bottom bracket is 112mm…which mount should I order? C. Does the plug on the Cyclone motor match the plug on the controller (4000W Sinewave ASI BAC) or will I be doing some soldering? Luna appears to be the best place to order the Cyclone kit....is there a better option, if yes why? I believe you want the larger bottom bracket for your application, but that is a guess. The kit is available from luna, as well as Sick Bike Parts, where I purchased it from. The controller hooks directly to motor leads, both hall sensor and power lines. The kit is about 90% plug and play, only the battery leads need attention. Guys what would you recommend when speaking of ease of installation, maintenance and durability - Cyclone 3000 or BBSHD?